Most invention and breakthroughs in science are accompanied by what is later described as "a sudden flash of genius." I have always imagined that this is what will happen when an effective treatment for Alzheimer's disease is discovered. 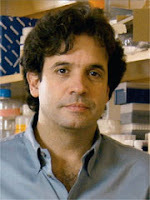 Rudy Tanzi is a professor of neurology and director of the genetics and aging unit at Massachusetts General Hospital. After having a beer with his buddies, Dr. Tanzi went back to his office and looked at his list of genes associated with Alzheimer's disease. He noticed that many of the genes looked like genes associated with the so-called innate immune system. He walked into the office of his colleague Robert Moir and mentioned this to him. Moir then handed Tanzi a spreadsheet, it was a comparison of A-beta and a well-known protein of the innate immune system, LL-37. They looked very similar. I'll spare you the long scientific explanation. Bottom line, they did a whole bunch of tests and came up with a new and different way of looking at amyloid beta and possible treatments for Alzheimer's disease. As I sit here typing I am wondering, did Dr. Rudolph Tanzi experience the sudden flash of genius? It is too early to tell, and it will be sometime before we know. Alzheimer's disease was first identified by Dr. Alois Alzheimer in 1906. Dr. Alzheimer noticed when he autopsied the brain of his patient, Auguste D, that the brain was riddled with sticky clumps and fibrous tangles. Almost 80 years later in 1984, scientists figured out that those clumps are made of a protein found throughout the body called amyloid. This discovery gave birth to the amyloid hypothesis, which holds that the accumulation of amyloid plaque in the brain slowly destroys brain cells. In the 1990s scientists began research in earnest to attack beta amyloid. Just recently, a series of experimental drugs that came out of this research have failed, and failed miserably. These include Flurizan, Alzemed, and now Dimebon. The list is long. I should interject I am not a scientist or a doctor. As a by product of the Alzheimer's Reading Room, I read more than 3,000 articles and scientific reports on Alzheimer's disease. I find myself wondering all the time, what came first the chicken or the egg? This gets us back to Dr. Tanzi. Back in 2007, Tanzi started work on his project to identify all the genes involved in Alzheimer's. More than 400 families affected by Alzheimer's disease were screened to determine genetic variants associated with the inheritance of Alzheimer's. He received backing for this project from the Cure Alzheimer's Fund. In layman's terms Dr. Tanzi is hypothesizing that A-beta may be part of the brain’s normal defenses against invading bacteria and other microbes. Why is this important? It raises question about treatments that are designed to eliminate A-beta from the brain. Dr. Tanzi's new hypothesis "says what we need is the equivalent of a statin for the brain so you can dial it down but not turn it off.” The it being beta amyloid, A-beta. A sudden flash of genius? Or another bridge to no where? It is too early to tell. I like this way of thinking outside the box. It seems to me the answer will come from outside the box. So imagine taking a medication like a statin which is designed to lower cholesterol, only to control the production of A-beta. Or a gene therapy designed to accomplish a similar mission. The incidence of Alzheimer's disease is projected to quadruple by 2050 to about 120 million worldwide. To put that in perspective it is about the same as the current population of Japan. The time bomb is ticking. Like everyone in the Alzheimer's community, I believe we need more funding for Alzheimer's research. We need to investigate all legitimate hypotheses. We need to do it now. We need to hope and pray for a sudden flash of genius. Maybe it already happened. We can only hope and pray. My name is Bob DeMarco, I am an Alzheimer's caregiver. My mother Dorothy, now 93 years old, suffers from Alzheimer's disease.